This multifunction printer is recommended for busy offices that would like to increase their productivity while lowering their printing costs. The Kyocera ECOSYS M3540idn is fast and reliable with an improved laser print engine and double-sided printing capabilities, fax, copy, and colour scan functions, while mobile printing support helps save time. However, it is quite overpriced for a device that cannot print in colour. This is a tall desktop all-in-one that weighs 22kg and measures 575mm tall, 455mm deep, and 475mm wide. The industrial design is overshadowed by the tech-savvy full colour touch panel that measures seven inches wide. The Kyocera M3540idn runs on 1024MB of memory as it is powered by a 667MHz processor. High-speed USB 2.0, two USB host ports, and GigaBit Ethernet are the standard interfaces, while paper is handled via a 500-sheet universal paper cassette, 75-sheet reversing document processor, and a 100-sheet multi-purpose tray. The 250-sheet output bin has a paper sensor to alert users when it is full. Produce double-sided documents fast in speeds of up to 40ppm in A4. The 33.6Kbps fax supports Super G3 faxing. Save time with the reversing document processor, AirPrint, and mobile printing. The large colour touch panel makes the Kyocera ECOSYS M3540idn easier to operate. Sharper and crisp documents, and smoother monochrome images are generated with the 1200dpi print resolution. HyPAS solution platform makes the Kyocera ECOSYS M3540idn highly customisable for user-friendly operation and management. 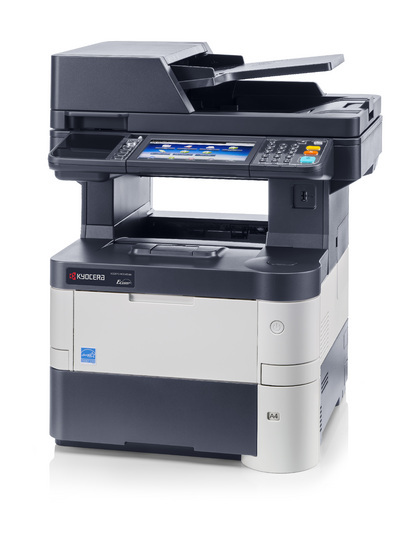 The Kyocera ECOSYS M3540idn does not print and produce copies in colour. The base unit is heavy and the tall structure requires additional headroom, making shelf or cabinet installations impossible. The Kyocera ECOSYS M3540idn also lacks Wi-Fi.